in reducing rates of nosocomial infection in very low birth weight infants. In newborn infants, especially very low birth weight (≤1500 g; VLBW) infants, the most common form of infection related to healthcare is nosocomial sepsis or bacteraemia. Ongoing measurement and assessment of their frequency and the associated risk factors may help prevent them. 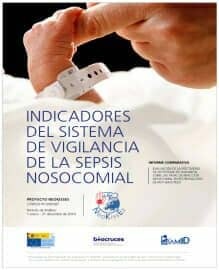 The main objectives of this study were to assess the effectiveness of the implementation of the “NeoKissEs” surveillance system for preventing nosocomial sepsis (NS), determine whether in neonatal intensive care units (NICUs) of the Spanish National Health System it was possible to reduce rates of NS and assess the benefits and limitations of applying the system in routine clinical practice from multiple perspectives. “NeoKissEs” is based on a surveillance system developed and successfully validated in VLBW infants admitted to German NICUs. The system has been implemented in a total of 47 hospitals in 14 autonomous Spanish regions. All of the units included can be considered level III in terms of the complexity of the care provided and their implementation teams are composed of neonatologists and nurses specialised in the care of premature infants. Since 2014, the NeoKissEs System has issued annual statistical reports presenting the systems’ indicators, with the goal of strengthening self-assessment and comparative analysis or benchmarking between participating units. This figure presents the records of patients and episodes of NS over the years the systems has been operating. Rate of Incidence of NS per 1,000 days of follow-up registered in the NeoKissEs system per year. Comparative analysis between NICUs has revealed great variations in rates between units, calling for a detailed study of the potential explanatory factors and strengthening of the culture promoting patient safety. This conceptual and ethical framework should drive forward activities focused on identifying areas for improvement in the care process and achieving a reduction in these infection rates. The team coordinating the NeoKissEs system is currently leading a new multicentre research project (PI17/00565) focused on the implementation of a multifactorial intervention related to central vascular catheter care. Its impact will be measured by the NeoKissEs surveillance system and it is hoped that it will succeed in reducing the incidence of catheter-related NS in VLBW infants admitted to NICUs participating in NeoKissEs. ▰ NeoKissEs provides an epidemiological surveillance system for continuous monitoring of NS in VLBW infants using standardised definitions and methods and allowing analysis of specific subgroups (by birth weight and gestational age). Its results are useful for comparing units and assessing seasonal trends and/or changes related to improvement interventions in clinical practice and other factors. ▰ The application of NeoKissEs is consolidated as a NS surveillance system for Spanish NICUs. We consider that the system should be extended as a standardised national reference system for VLBW infants. ▰ The results of the project (lack of evidence of an effect of surveillance on NS incidence and much higher rates recorded by the NeoKissEs System than those recorded in German NICUs) demonstrate the need and appropriateness of attempting to apply additional structured and evidence-based preventive interventions to reduce the rates of NS (INBERBAC-Neo project).